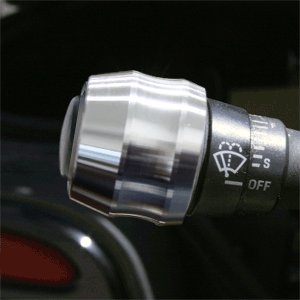 This CNC Machined Billet Turn Signal Knob Cover adds the perfect look to your 1994-2004 Ford Mustang and really balances out the look of the steering wheel! Crafted to cover the factory piece for a glove like fit. 1994 1995 1996 1997 1998 1999 2000 2001 2002 2003 2004 GT GTS Mustang Cobra Shelby Roush Saleen & Steeda Vehicles. 1999 2000 2001 2002 2003 2004 2005 2006 Superduty F250 F-250 F350 F-350 Excursion 1995 1996 1997 1998 1999 2000 2001 2002 2003 F150 F-150 Ranger Explorer No one else can stack up to the bold clean styling of our aftermarket Billet dress ups, Street Strip & Racing Suspension & Performance Parts for your late model American Muscle Car!